January 2003 was the first month of that common year. The month, which began on a Wednesday, ended on a Friday after 31 days. This is an archived version of Wikipedia's Current events Portal from January 2003. 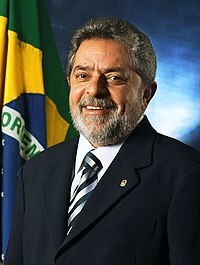 Luíz Inácio Lula da Silva ("Lula") becomes the 37th president of the Federative Republic of Brazil for the period (2003–2007). Da Silva was elected representing the Worker's Party with 61% percent of the vote. His inaugural speech includes vows to wipe out poverty, hunger, and corruption, but da Silva promised during the campaign to abide by an agreement with the International Monetary Fund to maintain a budget surplus of 3.75% and filled key economic posts with men considered friendly to foreign investment. Among guests at the inauguration were Venezuelan President Hugo Chávez, Cuban President Fidel Castro, and U.S. Trade Representative Robert Zoellick. The Turkish-registered tanker Vicky, with 70,000 tonnes of diesel cargo, struck the wreck of the sunken auto carrier Tricolor off the coast of Dunkirk, France. The double-hulled tanker freed itself from the wreck with the rising tide and sailed a mile off to check for leakage. The Vicky is the second ship to strike the wreck of the Tricolor since the carrier sank on December 14, 2002. A Royal Australian Air Force C-130 Hercules overflew the islands of Tikopia and Anuta in the Solomon Islands to inspect damage by Cyclone Zoe. The overflight carried officials of the Australian government agency AusAID. Reports show that there was damage to crops and traditional homes, but there may be no casualties among the islands' 1,600 inhabitants. The first 49 of a promised 1,264 West African peacekeepers arrive at Abidjan, Ivory Coast, to help supervise the cease-fire between the government of President Laurent Gbagbo and the main rebel group, the Patriotic Movement of the Ivory Coast. Rebellion against the Gbagbo government began September 19, 2002. The Economic Community of West African States (ECOWAS) agreed to send peacekeepers on September 29. The EECOWAS peacekeepers will join 2,500 French forces. Rebel groups occupy the northern half of Ivory Coast. French Foreign Minister Dominique de Villepin arrives in Ivory Coast to help mediate the conflict. Oil leakage from the sunken tanker Prestige threatens the southwestern coast of France. The prefect of Aquitaine reported a slick from the tanker is 50 kilometers (30 standard miles) from the coast. French Prime Minister Jean-Pierre Raffarin promised 50 million euros for the cleanup. The Prestige, which carried 77,000 tonnes of crude oil, sunk in late November 2002, off the coast of the Galician region of Spain. The People's Republic of China Foreign Ministry reacted to a report in the Israeli newspaper Ha'aretz which stated that Israel had complied with a U.S. request to suspend all contracts on the exports of arms and security equipment from the PRC to Israel. Israeli Defence Ministry Director-General Amos Yaron stated that Israel intends to "track down" all security ties with the PRC. An unnamed senior Israeli official stated that the Americans were using the pretext of protecting Taiwan to cover a proposed shift of American policy to allow direct arms sales to the PRC. United States Army division commanders are beginning a war game at US V Corps headquarters at Heidelberg, Germany, called VICTORY SCRIMMAGE. The exercise is under the command of Lieutenant General William S. Wallace, who is expected to command American ground forces in a planned U.S. war against Iraq. Clonaid Chief Executive Brigitte Boisselier told the French television station France 2 that the American parents of the supposed clone that Clonaid created are balking at providing DNA evidence to prove that their new-born baby "Eve" is really a clone. The claim is that the parents are afraid that Florida will try to take the baby away from them. The Immigration and Naturalization Service of the United States proposes rules that will require all Americans traveling abroad to disclose detailed personal information both before leaving the country and before being permitted to re-enter the country. In Bouaké, Ivory Coast, French Foreign Minister Dominique de Villepin met with political leaders of the Patriotic Movement of the Ivory Coast, who agreed to participate in negotiations to be held in Paris, France, the week of January 15, 2003. However, two independent rebel groups in the west of the country, assisted by fighters from Liberia, have seized villages and the cocoa crops inside those villages, forcing residents to flee to the port of San Pédro with no possessions. One-fifth of the world's cocoa crop passes through San Pédro. A French unit is guarding the port. U.S. plan to invade Iraq: United Nations arms inspectors from UNMOVIC have established a base of operations in Mosul, Iraq, 375 kilometers or 200 miles north of Baghdad, to speed the inspection process. College football: At the Fiesta Bowl in Tempe, Arizona, the Ohio State University Buckeyes defeated the University of Miami (Florida) Hurricanes, 31–24, to win the national championship. Willis McGahee blows up his knee in his eventual final game as a Miami Hurricane and Maurice Clarett concludes his Buckeyes career as a National Bowl Champion before challenging the NFL on entering the 2003 NFL Draft. Journalist Geoff Mackley reports after a helicopter mission that the Cyclone Zoe led to no casualties on the island of Tikopia, even though devastation was enormous. The 1,000 inhabitants of the island survived in caves. Reports that they had already resumed their daily occupations like fishing are misleading: they were "fishing" for their possessions that were blown out to sea. The situation on the island of Anuta with 600 inhabitants is not known yet. The flood in Germany turns out to be less severe than expected in the last few days. Exception is Wertheim am Main, where a 100-year-high is expected. Terrorist incident: A double suicide bombing shatters a busy area of Tel Aviv, Israel. 23 people are killed and about 100 are wounded. Both the Islamic Jihad and Hamas claim to be responsible for the double bombing. Jon Johansen was acquitted of all charges in the Norwegian DeCSS trial, in an important test case for copyright law. Kobe Bryant breaks NBA record for most 3-point field goals in a single game. War on Terrorism: British police announced details of the discovery of traces of the toxin ricin in a flat in Wood Green in North London in the wake of the arrest of six terrorist suspects. The timing of this news coincided with a major speech by Prime Minister Tony Blair dealing with the threat of terrorism and Britain's relationship with the U.S.A.
British Defence Secretary Geoff Hoon announced details of the call-up of reservists in the military build-up calculated to increase pressure on Iraq. French President Jacques Chirac, in a New Year's message to French forces, stated that French forces should be prepare to be activated if the United Nations decides on military action in Iraq. Indian Prime Minister Atal Bihari Vajpayee told an educational conference in Mumbai: "Our scientists are now talking of going to the Moon." Astronomers at the Institute for Advanced Study in Princeton have found the most distant extrasolar planet, OGLE-TR-56b, by a new technique of observing the intensity of light as a planet transits its sun, rather than by gravitational perturbation. North Korea threatens war if the United Nations applies economic sanctions. Air Midwest airplane crashes during take off from Charlotte, North Carolina's international airport, killing all 21 people aboard. The plane, headed to Greer, South Carolina, was not able to maintain altitude after take-off, crashing onto a US Airways plane hangar. In another crash, in Turkey, at least 74 of the 77 people on board died when a plane of the Turkish Airlines company, crashed while attempting an emergency landing at the Diyarbakir airport. UN Chief Weapons Inspector Hans Blix and International Atomic Energy Agency head Mohammed El Baradei give a report to the United Nations Security Council. They say that progress on the search for weapons of mass destruction in Iraq is "inching forward" but that a more "pro-active" stance is required from the Iraqi government. Astronomers at NASA's Goddard Space Flight Center obtain the most detail view yet of a black hole "feeding" at the centre of a quasar. North Korea formally withdraws from the Nuclear Nonproliferation Treaty. The INS registration deadline for males in the United States aged 16 and older from Afghanistan, Algeria, Bahrain, Eritrea, Lebanon, Morocco, North Korea, Oman, Qatar, Somalia, Tunisia, United Arab Emirates and Yemen. A controversial Bush administration policy designed to capture terrorists requires all such men to submit to "special registration" procedures consisting of fingerprinting, photographing, and lengthy interviews concerning their whereabouts, associations, and activities. Gordon Campbell, premier of British Columbia, is arrested for drunk driving on vacation in Maui. He is the first sitting Canadian premier to be arrested. A scandal ensues. George H. Ryan, Governor of Illinois, announced that he commuted the sentences of all 157 people on the state of Illinois' Death Row to life in prison. "Our capital system is haunted by the demon of error: error in determining guilt and error in determining who among the guilty deserves to die. What effect was race having? What effect was poverty having? Because of all these reasons, today I am commuting the sentences of all death row inmates", Ryan said. Ryan's term of office expires on January 13. A U.S. court ordered the controversial organization Clonaid, which claims that it produced a human clone, to reveal the identity and whereabouts of the alleged cloned baby. Idina Menzel married fellow broadway actor and Rent (musical) costar, Taye Diggs. North Korea threatens that the US will vanish in a "sea of fire" if it continues to challenge North Korea. Maurice Gibb of the band the Bee Gees passes away. Ariel Sharon and his Likud party are the target of continued accusations of political corruption. Steve Case announces his resignation as chairman of AOL after 18 years at the head of the company. Groundbreaking begins on Hong Kong Disneyland, scheduled to open in 2006. According to the Peruvian media, a Fokker F-28 is found which crashed near Chachapoyas. The 42 passengers and 4 crew members were all killed in the accident. War on Terrorism: Six more suspects were arrested in Bournemouth in England in connection with the investigation into ricin found in London. This brings the total of those arrested to eleven. The Indian government had to shamefully withdraw its case against Iftikhar Gilani to prevent itself from a rather piquant situation where two of its ministries would have given contradictory opinions. Gilani had been arrested under the Official Secrets Act 1923. War on Terrorism: Three more suspects have been arrested in Manchester in England in connection with the investigation into ricin found in London, although it now appears as though the raid was initially carried out as the pursuance of an investigation into immigration issues. A Special Branch police officer, Stephen Oake, was fatally stabbed during the arrests, and three other officers were also injured, one seriously. This brings the total of those arrested to fourteen. British humanitarian agency Care International warns that the security situation in Afghanistan is "urgent" and warns that coalition troops should not redirect resources from security to nation-building efforts, as this could enable factional forces to overthrow the internationally backed government in Kabul. 20,000 workers at US industrial giant General Electric go on strike in 23 states over a GE plan to require workers to pay more for health insurance benefits. Belgian plant pathologist, Emile Frison, of the International Network for the Improvement of Banana and Plantain states that the commercial banana variety may become extinct within 10 years. In a 7–2 decision in the case Eldred v. Ashcroft, the Supreme Court of the United States rules the 1998 Sonny Bono Copyright Term Extension Act constitutional, preventing the expiration of any U.S. copyrights for 20 years from the date the law went into effect. A statement, issued by the Congregation for the Doctrine of the Faith and signed by Pope John Paul II, declared that all Roman Catholic politicians must adhere to church teachings, and that they cannot be faithful to the Church if they vote against Church positions on such issues as abortion. Robert L. Ehrlich, (born November 25, 1957), an American politician, becomes the 60th Governor of the State of Maryland. Borland Software Corporation (Nasdaq NM: BORL) announced the completion of its acquisition of TogetherSoft Corporation. Borland acquired the privately held TogetherSoft for approximately $82.5 million (cash) plus 9,050,000 shares of Borland common stock (reported as a total of $185 million) [news on Borland website]. President Bush visits the University of Scranton in downtown Scranton, Pennsylvania, to give a speech on medical liability reform amidst major medical malpractice in northeastern Pennsylvania. Bush criticized state attorneys for "frivolous lawsuits", vowing to decrease excessive jury awards and propose a $250,000 cap on non-economic damages. The president later paid a visit to Scranton's Mercy Hospital. US Senator Russ Feingold introduces a bill to halt the Information Awareness Office and Total Information Awareness pending a review of privacy issues involved. The US Congress attempting to suspend an internal Department of Defense project is a highly unusual step. UN weapons inspectors in Iraq stated that they found empty rocket warheads, designed to carry chemical warfare agents, at the Ukhaider Ammunition Storage Area. The Space Shuttle Columbia launches on its last mission STS-107. It disintegrated on re-entry 16 days later. Tom Ridge is unanimously recommended by a United States Senate subcommittee to be confirmed by the full Senate as head of the new United States Department of Homeland Security which is scheduled to begin operation on January 24. A 1.3-mile tunnel, representing the latest major piece of Boston, Massachusetts' Big Dig, opened, connecting the Massachusetts Turnpike to Logan International Airport. The tunnel reduced the trip from downtown Boston from 45 minutes in traffic to 8 minutes. The next phase, taking the elevated Interstate 93 and putting it underground, should be finished by early 2004. Gertrude Janeway, the last widow of a Union veteran from the American Civil War, died at the age of 93, in Blaine, Tennessee. Gertrude married John Janeway in 1927, when she was 18 and he was 81. He died in 1937. Still alive is Confederate widow Alberta Martin, of Elba, Alabama. A mass mobilization pulls together global protests against the Iraq war in cities around the world, including Tokyo, Moscow, Paris, London, Montreal, Ottawa, Toronto, Cologne, Bonn, Gothenburg, Istanbul and Cairo. NION and ANSWER hold protests in Washington, D.C. and San Francisco, California. The Swiss yacht Allinghi, captained by New Zealand skipper Russell Coutts, defeated Oracle, a San Francisco, California-based yacht, to win the challenger final of the America's Cup. Allinghi will now face the New Zealand defender, yet to be determined. In Australia, the most devastating bushfire since the Ash Wednesday fires in 1983 hits Canberra and the Australian Capital Territory. Four people are to die, 520 homes and thousands of hectares of national park will be destroyed, 259 people will be admitted to The Canberra Hospital with burns and A$250 million will be paid by insurance companies. The Golden Globe awards are held in Beverley Hills. Martin Scorsese wins Best Director for Gangs of New York. Chicago wins three awards. Finsbury Park mosque in Finsbury Park, London, England, often associated with Islamic extremism, was raided by British police in an investigation related to the hunt for the poison ricin. Seven men who were apparently living at the mosque were arrested, and a replica firearm, tear gas and a stun gun were reported as having been found on the premises. As part of the plan to invade Iraq, British Defence Secretary Geoff Hoon announces that 26,000 British troops and equipment including 120 tanks will be sent to Kuwait, joining the 5,000 troops already on their way there. An earthquake hits Mexico that is 7.6 on the Richter scale. The center of the earthquake was on located on the Pacific coast, in the State of Colima. The earthquake was felt as far as in Mexico City. Convicted cracker Kevin Mitnick is allowed to use a computer again. The RIAA, a music industry lobbying group, announces that Hilary Rosen will step down as head of the organization at the end of 2003. Rosen achieved notoriety on the Internet for her prolific efforts to halt the spread of copyrighted MP3 recordings on peer-to-peer file sharing networks such as Napster and Kazaa. Reports indicate that the members of the RIAA are unhappy with Rosen's nearly total failure to achieve this goal. Elections for the House of Representatives, the lower house of parliament of the Netherlands. The Dutch Labour Party wins, but Christian Democratic Appeal (CDA) remains the largest party in parliament. Pim Fortuyn List loses. CDA and People's Party for Freedom and Democracy do not get a majority. A large Arctic air mass over much of central North America brings severe cold and wind chill over much of southern Canada and northern United States for several days. Germany and France celebrate the 40th anniversary of their friendship in Versailles (Elysée Treaty). Pie and Bovril (P&B) Scottish Football forum launched. 350 Australian troops begin their journey towards Iraq, joining the US and UK troops already assembled there. Prime Minister John Howard said that "pre-positioning troops increased the likelihood of (the crisis) being resolved peacefully". Around 150 people protested as the troop ship left Sydney, some shouting "Go yourself!" to Mr. Howard. Fast food restaurant chain McDonald's reports a quarterly loss for the first time. The loss amounted to US$344 million. Shares in the company fell around 3% on the news. The last signal from Pioneer 10 was detected before losing signal with it completely. Hulk Hogan returns to WWE. The msy Wind Song was towed into the Sea of the Moon between Tahiti and Moorea and sunk in 9,843 feet of water. War on Terrorism: The United States Department of Homeland Security officially began operation, and former governor Tom Ridge took command. Reorganization of other departments affected by its creation in the United States Government would continue for some time. This represented the largest reorganization of the United States Government since the creation of the United States Department of Defense during World War II. The Internet was attacked by very high traffic caused by a self-replicating software worm program called "SQL Slammer". This attacked Microsoft SQL servers, causing them to spray the Internet with more copies of the worm program. This was made possible by a security vulnerability in Microsoft SQL Server. The worm attack had the side effect of causing a distributed denial-of-service attack on the rest of the Internet. The New Democratic Party in Canada picks Toronto city councillor Jack Layton as its new leader, replacing Alexa McDonough, at its convention in Toronto. Layton wins on the first ballot, beating veteran MP Bill Blaikie. American football Super Bowl XXXVII: The Tampa Bay Buccaneers defeated the Oakland Raiders, 48–21. Speaking to the United Nations Security Council, Iraqi Foreign Minister Naji Sabri said that the United States and its allies are "unjustifiably aggressive" and that Iraq is complying fully with requests made by the UN weapons inspectors. Speaking to the same forum, Hans Blix, the chief inspector, later said that Iraq had not been fully co-operative with the United Nations inspection teams. An election in the state of Oregon to pass a temporary three-year income tax failed with 54% of the votes voting against and 44% voting for. This forced the first layoffs in the Oregon State Police since its creation in 1931, and other actions including cutbacks in many of the local school districts. A false rumor that Thai actress Suvanant Kongying had told a reporter that the temple ruins at Angkor really belong to Thailand led to a riot in Phnom Penh, Cambodia. This caused the destruction of the Thai Embassy and dozens of Thai-owned businesses, hotels and factories. Would-be shoe-bomber Richard Reid is sentenced to life in prison for trying to down American Airlines Flight 63 from Paris to Miami. Reid had previously pleaded guilty. France strongly advises its citizens to leave the Ivory Coast. 1,500 French nationals remain trapped in the airport of the commercial capital Abidjan, which is surrounded by a crowd of around 5,000 supporters of President Laurent Gbagbo. Last week, the French brokered a power-sharing deal between the Government and the Northern rebels. ^ "Geoff Mackley's Site Directory". Geoffmackley.com. Retrieved 2012-02-11. ^ UK ambassador Jeremy Greenstock (2003-01-09). "Middle East | UN: Iraq must be pro-active". BBC News. Retrieved 2012-02-11. ^ "Science/Nature | Close-up on a quasar". BBC News. 2003-01-10. Retrieved 2012-02-11. ^ "News | English". Voanews.com. Retrieved 2012-02-11. ^ Care International (2003-01-14). "South Asia | Afghan security situation 'urgent'". BBC News. Retrieved 2012-02-11. ^ Bob Reynolds, GE worker (2003-01-14). "Business | Mass walk-out at US industrial giant". BBC News. Retrieved 2012-02-11. ^ "Pentagon database plan hits snag on Hill - CNET News". News.com.com. Archived from the original on 2012-07-11. Retrieved 2012-02-11. ^ "Entertainment | Chicago triumphs at Golden Globes". BBC News. 2003-01-20. Retrieved 2012-02-11. ^ "Fire Damages Ancient Palace in Central China". English.peopledaily.com.cn. 2003-01-21. Retrieved 2012-02-11. ^ Sheikh Abu Hamza (2003-01-20). "UK | England | Seven questioned after mosque raid". BBC News. Retrieved 2012-02-11. ^ "UK | UK sends 31,000 troops to Gulf". BBC News. 2003-01-20. Retrieved 2012-02-11. ^ "Asia-Pacific | Australia sends troops to the Gulf". BBC News. 2003-01-23. Retrieved 2012-02-11. ^ "Business | McDonald's posts first-ever loss". BBC News. 2003-01-23. Retrieved 2012-02-11. ^ "Americas | Iraq defiant ahead of UN report". BBC News. 2003-01-27. Retrieved 2012-02-11. ^ French foreign ministry (2003-01-31). "Africa | France urges Ivory Coast pull-out". BBC News. Retrieved 2012-02-11. Wikimedia Commons has media related to January 2003.